The Dalek Mod for Minecraft 1.8.9, 1.7.10 and 1.7.2 is a modification that is perfect for all of the Doctor Who lovers out there! However, I personally think that you can enjoy the features that this mod brings to vanilla Minecraft even if you are not a fan of the series. 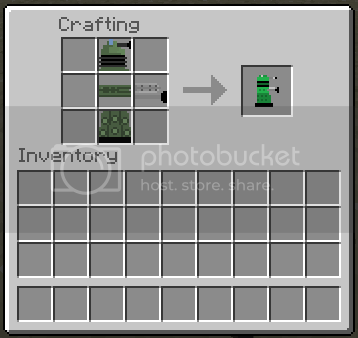 The Dalek Mod for Minecraft 1.8.9, 1.7.10 and 1.7.2 is a vast mod that covers all areas of the game, from combat features to crafting recipes. In this expansive mod, additions include the likes of different coloured Daleks, different Doctor cars and even the famous Tardis! This mod is a must have for all Doctor Who lovers, but is a fantastic mod regardless! Dalek colours include red, yellow, blue, black, gold and even stone Daleks are added! This mod is available for both client and server, so you can enjoy all that this mod adds to the game with your friends! Imperial and Renegade Daleks, a Tardis key, Cybermen and Cyberleaders? What more could you possibly want! A seperate download includes all of the sound effects that are available for the mod install. POSITIVES: There shear expansive nature of this mod means that you will never get bored of it! This modification adds so much new content that it would be virtually impossible to describe it all here! This mod is available for both client and server downloads, includes a full functional sound pack, and is currently updated to the latest version of Minecraft. NEGATIVES: After playing this mod for a while, I can’t pick any faults with the playability of it. The mod runs smoothly and bugless, updates are frequent and overall it provides a unique Doctor Who/Minecraft experience. First of all, you need to install the latest version of MINECRAFT FORGE to correctly run this mod. Next, download the Dalek Mod for Minecraft 1.8.9, 1.7.10 and 1.7.2 and drag and drop the .zip folder into the ‘mods’ folder of your Minecraft directory and run the game using forge! The mod should be correctly installed and now you can enjoy all that it has to offer!